Sigma Delta Pi is the only honor society devoted exclusively to students of Spanish in four-year colleges and universities. Sigma Delta Pi is not only the largest foreign-language honor society in existence, it is among the elite as attested by its membership since 1966 in theAssociation of College Honor Societies (ACHS), the nation’s only certifying agency for college and university honor societies. Bestowal of membership in Sigma Delta Pi is an excellent way to reward outstanding students of Spanish in colleges and universities. If properly advertised on the campus, a chapter of Sigma Delta Pi can help encourage students to remain in the department and to take advanced courses in Spanish. Honor and recognition through election to membership in a renowned national society can be a powerful incentive! Sigma Delta Pi has a generous scholarship program exclusively for its active members with annual undergraduate awards for study in Spanish-speaking countries. Sigma Delta Pi offers yearly research grants for graduate students. Active chapters may apply for Chapter Project Grants to help finance local activities that complement the mission of Sigma Delta Pi. Active student members (graduate and undergraduate) are afforded numerous leadership opportunities both at the local level as chapter officers, and at the national level with the Board of Student Advisers. 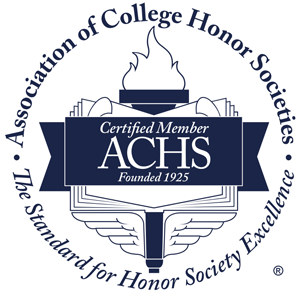 Active chapters may also apply for grants from the Association of College Honor Societies for cross-campus collaboration and new initiatives among student organizations. Chapters may call upon their regional Vice President for help in planning a program of activities. Each chapter is authorized to recognize with honorary membership outstanding individuals who are earnest supporters of things Hispanic, in accordance with the Society’s constitution. Also, a chapter may nominate especially qualified Hispanophiles for membership in La Orden de los Descubridores and in La Orden de Don Quijote, the Society’s highest award. A chapter may nominate one student per year for the Gabriela Mistral Award, a signal honor for an especially outstanding student. Membership in Sigma Delta Pi strengthens one’s application for a position in any professional field, including business. For example, see the Qualifications Standards for General Schedule Positions at the website of the United States Office of Personnel Management. Once every three years, the Premio José Martel is awarded to the outstanding adviser selected from among all chapters in the United States. In addition to a handsome plaque, the winner receives a generous cash award. Each year, the Premio Minaya Álvar-Fáñez is granted to one chapter adviser for exemplary initiative in encouraging and assisting with chapter activities. The winner receives a plaque and cash award. By establishing a chapter on its campus, a college or university performs an outstanding service for its students of Spanish by encouraging exeptional academic achievement in Hispanic studies. In national or international professional associations, such as the AATSP, which publish personal résumés prior to elections, nominees for office include membership in Sigma Delta Pi. Election to Sigma Delta Pi affords the serious Spanish student the opportunity for closer association with students of similar interests and out-of-class association with members of the faculty. An active chapter promotes many cultural activities on Hispanic themes; students, faculty and visitors from the community are attracted to the Spanish instructional program of the school. By conducting impressive chapter activities that represent the ideals of Sigma Delta Pi, a chapter can be designated an Honor Chapter for excellent work on the part of the advisor and student members. To the the Society’s most outstanding chapter, the Ignacio y Sophie Galbis Award is presented annually; for chapters earning the Honor Chapter distinction for a complete triennium, the Octavio Paz Award is granted. Each year, the Premio Frida Kahlo is presented to a chapter for its exceptional website. The national offices encourage statewide or regional symposia and meetings where chapters may share ideas and participate in programs. Each chapter may send delegates to the annual informative session, held in conjunction with the Kentucky Foreign Language Conference, and to each triennial convention, held in conjunction with the annual meeting of the AATSP. Sigma Delta Pi has multiple partnerships with educational institutions and corporations that support the Society’s mission and provide special benefits for our members.